Proper clarinet air support is crucial to a good, warm clarinet sound. AIR! 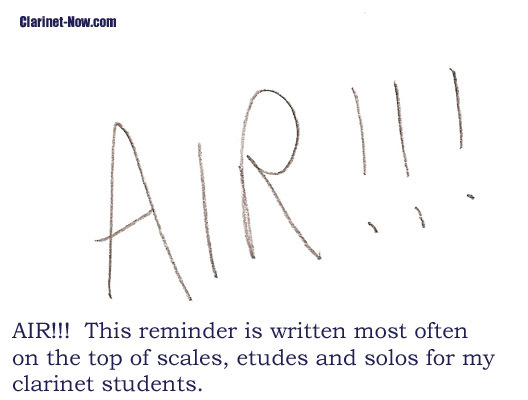 This is probably one of the most common “reminders” I write on student’s music, etudes and lesson sheets. It was written on many of my solos and etudes when I was a student. I still often write reminders to myself on music to take BIG BREATHS (BB) and arrows all over the place to blow more air over certain intervals, altissimo figures, “dig-out” low notes, on and on and on…. If you are looking for information on clarinet air leaks, click here. Your clarinet is a wood WIND instrument, right? Quality air support is a must for several reasons: full, warm, controlled sound; proper generation behind articulation; good connections especially over the break and altissimo ranges. 1. Wimpy sound – airy, thin, weak, bright, brittle sound. 2. Bad note starts – late start, foo-ah start, whaah start. 3. Luggy articulation – tongue not working fast enough, tongue dragging down note pitches. 4. Monotone phrasing – no dynamics, boring playing and sound. For a full, warm, controlled sound – blow through the clarinet like you really want the air to reach the bell of the instrument. Take a BIG BREATH (BB) before you play. Many times I write on music (for students or myself) places to take a BB. For beginning clarinetists, count one whole measure before you play. Breathe in during that whole measure. The proper clarinet air support BIG BREATH. How to take a BIG BREATH properly. Often, when beginners or amateurs take BIG BREATHS, they crunch up their shoulders. This is NOT breathing properly. Think of this, when you lay in bed at night on your back, do your shoulders move while you breathe? No, your stomach moves up and down. It’s actually your diaphragm that does the work. Your diaphragm, you may know it best as your stomach, goes out while you breathe in, it is helping the lungs fill-up with air. Then, when your lungs are full, you push the air out with your diaphragm. Now, take a BIG BREATH. Fill what seems like your stomach up all the way to your thumbs. Now, blow out fast air. While doing that exercise, try it again in front of a mirror. Make sure you are not raising your shoulders while breathing in. Now, test this, put one hand in front of your mouth, take in your BIG BREATH. Blow. Is the air warm and slow or fast and cold? Cold and fast air is almost correct simply for this reason - you are trying too hard and tensing up. While blowing cold and fast air you are probably closing up your throat, closing your lips and making a really strange look on your face (tensing up). So, you’ve almost got the ideas. Now, open up your throat and make an “ooh” sound or feel. Warm and fast air is correct because you’ll maximize your air for a full, warm sound. Making an “ooh” sound or feel helps you open up that oral cavity and fill-up the clarinet. Warm and fast air is your best solution to getting good clarinet air support. If your air is warm and slow, now try this. Put your hand in front of you at a full arms length. Now blow at it. If you can feel the air easily on the palm of your hand, you are well on your way to good air support. Remember cold and fast air is almost right. Try to get the air to your hand without “tensing-up.” If you stand close to a mirror, you can fog it up with warm, slow air. Stand an arm’s length away from the mirror. Fogging it up at this distance is not really possible. One of the biggest lessons I learned from Richard Stoltzman was watching him take air in during master classes and in his performances. Watch him take a breath. You’ll practically see the walls and ceiling bow inwards with his inward breathing. Then, listen to that sound. Yep, if you want a good, full, rich, deep clarinet sound, you are going to have to learn how to take a good breath. Other notes about clarinet air support: Take a major scale of your choice. Ascend the octave and then descend the octave. While ascending, keep a nice steady sound. While descending, dig the notes out with your breath. Act as if you are crescendoing back to the tonic (or first note) of the scale. Use fast air while crossing the break both ascending and descending. Let’s take throat tone A natural to B natural across the break. As your fingers make the change, make sure you blow fast air to get over the interval. Keep your embouchure stable at this point. This is also true for descending below the break. Keep the air fast, do not drop your jaw or lip, and act like you are “digging-out” the sound of the lower notes. A TIP FOR ACCESSING GOOD AIR While in graduate school, I had some air support issues and was frustrated that I couldn’t take enough air. My teacher suggested that I swim. I did try swimming but I soon developed a running habit as well as a hiking habit. Good cardiovascular fitness not only helps you become a healthier human but also a better clarinetist. Even taking a vigorous walk can help you out in this area. For me, nothing beats a good walk over a mountain. One last point about AIR and the clarinet: Pick your clarinet up. Look at it now. Now, do this. Listen to it. What does it sound like? That instrument is just a pile of wood (or plastic), metal, cork and pads. It is inanimate without you, the clarinetist. Now, one of the first differences between you and other clarinetists is this, AIR!! Not bad AIR, but quality clarinet air support. Fill that clarinet up. Blow like there is no tomorrow. Good luck. Now, go practice. Great question Clarinet Air Support Question. First of all, the fact that you are aware of your shoulders raising while you breathe, you have a head start in correcting this. Right now, in front of the computer, breathe. Take little breaths and then big ones. Are your shoulders moving? Also, try this. Lie down on the ground, a bed or couch. Take some really big breaths in and out. Even try to breathe in slow and out slow. Here, your shoulders should not move at all. You will probably learn that your tummy, stomach, diaphragm (whatever you want to call it), as you lay down, move up and down. That tummy is working the air in your lungs. That is where all of your breathing energy should occur (besides the mouth, of course). Breathe in now, and try to fill the sides of your diaphragm (about where your elbows touch your upper torso). If you fill that area, you are really filling your lungs up well and this knowledge alone will help your Clarinet Air Support. Now, with all of this in mind, sit or stand in front of a large mirror with or without your clarinet. Try all of these and watch your shoulders. Raising the shoulders actually doesn't add any quality to your air intake. Now, get your clarinet, and breathe in big and consciously watch and think about your shoulders. Take in big air and blow into the clarinet. Practice often in front of a mirror and watch for this and try to self-correct. Now for the Clarinet Air Support exercise: Sit or stand in front of the mirror. Use a long tone C in the left hand (one ledger line below the treble staff). Put on a metronome at quarter note equals 72. Breathe in for four counts, play for eight counts, rest four counts, breath in four counts and play for eight counts. Do the same exercise, except ascend by half-steps up the scale: C#, D, D#, E, F, F#, G.
Going up the entire scale of the clarinet is optimum, but could come off as boring. 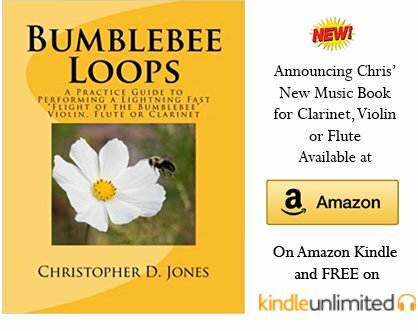 If you go the interval of a fifth each day, but in different ranges, you’ll see excellent improvement in your breathing, sound quality and clarinet air support. It is most important that you do some long tones each day. While you are practicing these long-tone exercises, think about keeping the sound of the long tone steady. Try not having “waves” or “bumps” in the sound. I probably need to write another entire page on long tones. Your main goal now is to improve your shoulders. So, watch your shoulders. When you start working on your normal lesson or band materials, think about the shoulders. I think you can overcome this and can spend that extra shoulder energy on making the music more exciting. Best of practicing to you and let me know how things work out.